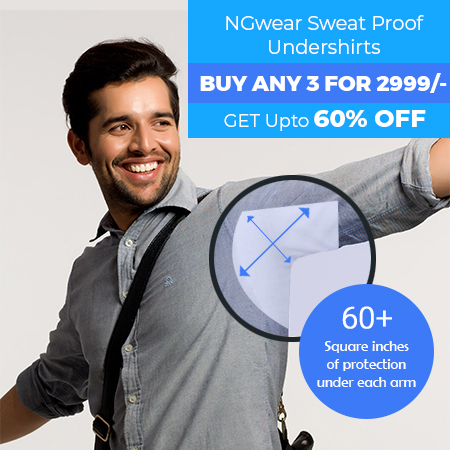 NGwear undershirts are made from micro modal material, which offers maximum protection in terms of perspiration. Its inner layer provides a barrier between your outer garments and perspiration, and effectively covers the chest, back and armpit areas. Many people sweat as a result of hot weather or exertion; but some people simply sweat more than others. With around six percent of people suffering from a condition called hyperhidrosis, or excessive sweating, sweat-proof shirts can be a great help. Whether you simply sweat a lot, or are active every day, our sweat-proof undershirts are the perfect solution. At NGwear we believe that our high-quality sweat-proof undershirts should provide more than just the ability to eliminate perspiration. 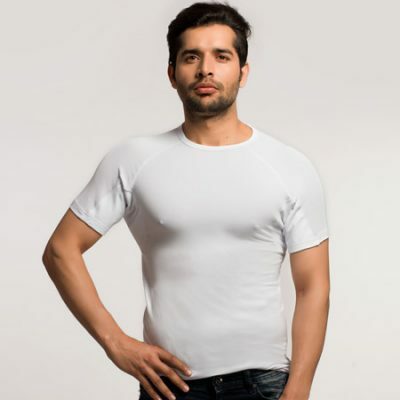 That’s why our undershirts offer so much more; with the help of silver permanently bound to the inner fibers, it effectively absorbs heat from the body when you are hot, and in turn keeps you hot when you feel cold. The shirt can effectively control your body temperature all day long. Perspiration causes sweat to interact with bacteria, and as a result, causes unpleasant odors. The silver in our shirt fibers are designed to help eliminate bad odors and also counteracts the bacteria, ensuring that you are kept comfortable and fresh at all times. Another benefit of micro modal material is that it is very comfortable and also silky smooth. This means it won’t irritate the skin or cause any scratching and offers a protective layer to the skin. This high-quality material makes it very comfortable to wear our stylish sweat-proof shirts underneath your clothing. It’s smooth and comfortable enough to allow clothing to simply glide over it. This gives you a stylish, seamless look all day long. This undershirt from NG Wear is completely unnoticeable, as this is also the same material used in many under garments. Our undershirts offer you the ultimate in style and comfort, allowing you to wear them with any type of clothing. These shirts can be worn with a dress shirt, buttoned up with a tie, or even with a t-shirt or dress shirt without a tie. 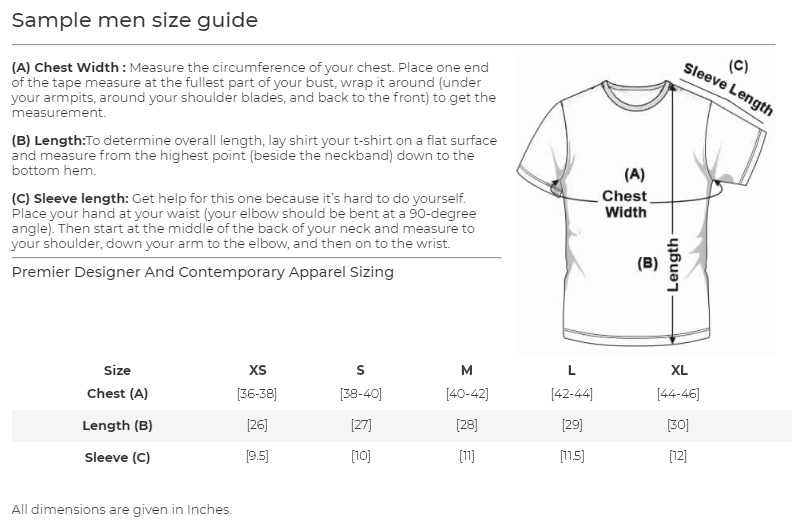 The deep V-cut is perfectly hidden underneath your shirt, but still effective in covering your chest area. You can also consider our crewneck undershirt. This comfortable deep V-neck sweat-proof undershirt is very functional and uses modern technology to allow it to be ideal for anyone looking for a solution to excessive perspiration. It can be worn every day and is durable enough to withstand numerous washes. 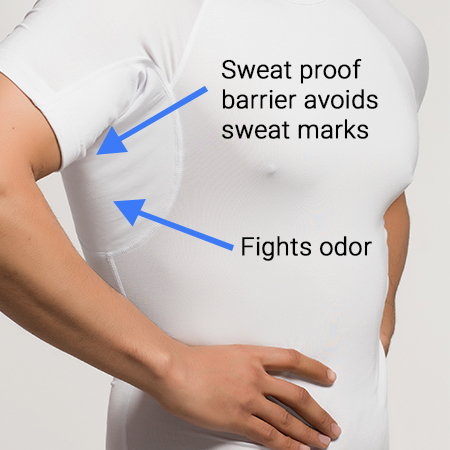 NGwear’s undershirts have been specifically made to offer a solution to the problem of sweat marks showing on your outer clothing as a result of excessive sweating. 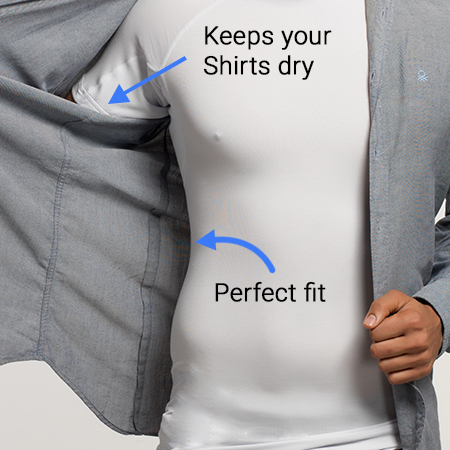 These undershirts have an integral sweat shield that is built-in to ensure that sweat is stopped from breaking through to your clothing and showing during every day activities. The fabric in these shirts is especially designed to be super absorbent and to effectively prevent sweat marks from breaking through, especially on the chest, back and underarm areas. Great Product!! Perfect product to block the sweat very helpful and effective.!! Highly Recommended I would totally recommend this product to everyone. It works really well. A must have product. Very helpful! This product has helped me become more confident about my clothing and appeal in my work place. A big thumbs up and highly recommended to anyone who wants to dress up clean! Mind blowing product This t shirt Really works !amazing results and the most effective product out there .it absorbs sweat very easily and is bery light and breathable ,plus amazing staff and service . Perfectly does its work but fitting is not upto the mark Excellent in terms of sweat resistance, it perfectly blocks the sweat. But fitting of the T-shirt is not proper. I ordered small size though I actually wear medium still it shaags from the underarm, the pad doesn't stick to the armpit properly. Check the arms of the model in the picture. Finally a solution for Hyperhidrosis Have been looking for something like this for quite a long time now. I ordered 2 in time span of a week. It's 100% effective and it's also odour free. Very friendly and humble staff. Had a great overall experience. Highly recommend to people looking for a swear proof undershirt. A quality solution to my daily problem Sweating and its odour is an everyday problem for a lot of people including me. And I never found an easy and durable solution to the problem before. Until now I used to rely and do a million different things to keep sweat at bay and finally I have a quality solution to my problem something that is easy to do, durable and actually keeps sweat away. The NG Wear undershirt made my daily life easy. I have a more pleasant life The undershit actually helped me get a more pleasant life in general, I used to be always irritated with the sweating and patches and the weirdness, it increased my stress levels and my anxiety levels, thanks to the tee. I lead a more pleasant life now. I bought 5 of them So the first one worked really great and I needed more for everyday use. And now I have 5 of them in different neck lines. I just couldn't stop myself, they work so great for hyperhidrosis. Good experience Good product and nice packaging, will definitey buy more. People with hyperhidrosis must give it a try. It's worth it. So effective the tee is really effective, and it actually kills the odour. Awesome. Excellent product! Got this undershirt to block sweat marks on my office shirts. Works 100% all through out the day. Got for it if you suffer from hyperhidrosis. Highly recommended.